Drawing all the elements of my project together for a test performance next month, is challenging. Luckily I have such excellent project management and access support from Foteini Galanopoulou. Tactile sound, stage lighting, audience interactive lighting, cello reactive lighting, assistive music technology, dance ribbons, story. Sophie bought so much light into my life. One of the last things we did together was playing in the Drake Music Connect and Collaborate Band. Sophie was using thumb jam on ipad, and that’s why I am dedicating the development of new technology on the project to her. 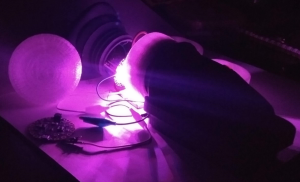 Don’t ask me how it works, but creative technologist Charles Matthews is making a sound to light DMX controller, designed with access in mind. When completed it will be open source and the parts are low cost, so many people could potentially benefit, it’s also fully compatible with stage lighting. I love linking sound to colour. Here we are testing it at New River Studios. Here is a short clip from a development day with creative technologist Charles Matthews. Improvising with cello reactive colour. Trigger warning: please note there are some flashing lights in this video. Could the colours flash more slowly? Nice! Lovely thanks. Hi Colette, thankyou, good point. Yes we will be looking to smooth it out and link specific colours to notes. I think at the time Charles was flicking through the colours to see which ones I liked, but, because I hadn’t done it before I liked all the colours at once! Thanks Richard, yes the colours can be chosen for each note.